Creepy Jar continues to work diligently on their open-world survival simulator, Green Hell and today they’re releasing their first big update to the game, the Animal Update. 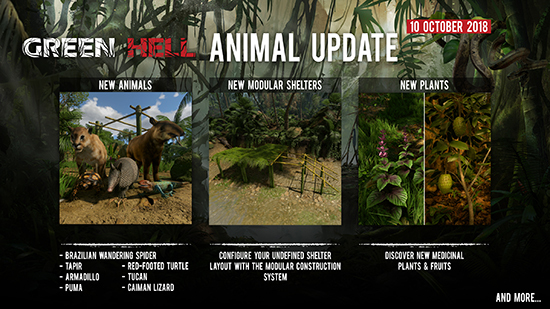 Detailed in the Green Hell Roadmap just a few weeks ago, the Animal Update brings so much more to the game than just additional creepy crawlies to the Early Access title with new medicinal plants and herbs, modular shelter options, and even a new challenge! The humid depths of the Amazon rainforest have never been more dangerous with the addition of predators like the Puma and the Brazilian Wandering Spider, but all hope is not lost. The ability to create your own shelter will now offer a safe haven from the hazards of the outside world and new remedies can be found among the plants and herbs of the lush rainforest foliage. How long can you survive against the dangers of the unknown? Focusing on listening to their community while constantly looking to improve the Green Hell experience, Creepy Jar has also made a massive number of changes and fixes which you can find in the detailed changelog on Steam. 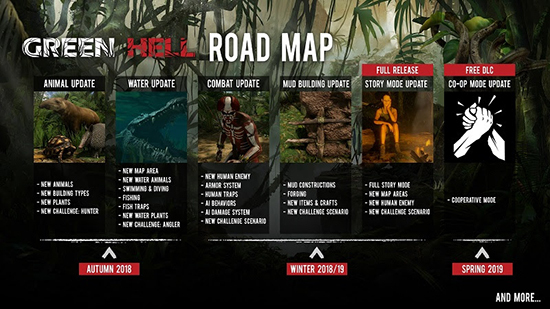 For a look at what’s coming down the line for Green Hell, take a look at the Green Hell Roadmap! Realistic Survival Simulator - Green Hell puts great focus on realism in both its world building and gameplay. Everything that is crafted or built is necessary for survival, and was consulted on with experts. The Amazon is not a typical forest; threats are literally crawling under your skin. Psychological Thriller - Waking up in the middle of the Amazon with no recollection of how you got there or how you’ll get out, the hardest battle you’ll face is the fight against yourself and your weaknesses and fears. Fully Alive Amazon Rainforest - Every effort has gone into recreating the lush world of the Amazon in painstaking detail. An exotic and dangerous place, this jungle is filled with many hazards beyond predators including toxic plants, illnesses and infections, all waiting to bring the player to their demise. Body Inspection - Dangers lurk around every bend but they also live under your very skin. Paramount to your survival is checking your body for parasites, infections, and wounds. Take care or suffer the consequences.